Reminds me of how I used to cruise down the California highway in a pickup; the difference would be scale and speed. And yes, you do have to adjust for crosswind. I bought the Fessor Cargo ship module (excellent ship) and it got me thinking. The ship is a breakaway based 400 ton design with 196 tons of breakaway hull capability. You can mix and match various modules to meet whatever mission you are on. The ship has 40o tons with 2 turrets on it. At 400 tons the ship would be allowed 4 turrets. If the 196 tons of modules are absent (4 modules of 49 tons each). The remaining ship would be 204 tons and have 2 turrets. If the breakaway modules are attached the ship would have 4 turrets. Where do the turrets go? If the turrets are on the central core you could have a 204 ton ship with 4 turrets. This could result in a faster ship with more turrets than a ship of equal tonnage. If you have a turret on one of the breakawy modules you might end up with a 49 ton module with a turret (or maybe a barbette to push the example even further). How do you place turrets on your breakaway hull designs? A single firm point can be exchanged for a single weapon turret. Since a 49 dTon hull can have 2 firm points, in theory, it can have 2 small turrets (I'll use the terminology of small, medium, and large turrets to denote a single weapon turret, a dual weapon turret, and a triple weapon turret respectively. This rule allows for violation of the 1 turret per 100 dTon rule right off the bat. In order to fix THAT issue, I'd simply state that when a firm point is converted to a Small turret, it automatically negates the ability to have more than one "firm point" armed with a weapon system. In other words, a 2 firm point hull can either be armed with a small turret weapon OR two firm points, but not both. If you have four hulls of 49 dTons - each armed with a single turret - that is 4 weapons total. Add to this the turret totals of 6 weapons possible on the 202 dTon hull, and you end up with 10 weapons. This is less than the 12 possible. That's 8 firm points plus 6 weapons. 1) weapon ranges are reduced such that none may be greater than "close range"
2) weapons with ranges medium or less are reduced in range to "adjacent"
Missile racks also suffer somewhat in that they lose 2/3rds of their ammunition capacity as compared against a standard Turret. "This whole process consumes 2% of the combined hull tonnage for the extra bulkheads and connections needed, and costs an additional MCr2 per ton consumed." Logically, if one has this cost as a one time cost regardless of how many sub-hulls there are, and these "things" purchased for 2 MCr per ton consumed has to be links that keep the hulls together, permit power couplings etc between hulls - a single ship with two sub-hulls, will have stronger connections between each other if there are only two sub-hulls than if it has 3 sub-hulls. These "links" are supposed to render the two sub-hulls immune to issues such as acceleration etc so that they might operate as a single hull right? I have a strong sneaking suspicion that the 2% cost is PER additional sub-hull. Put another way? Suppose you're dealing with a single "Hull" that has two sub-hull components. Combined Hull capacity is 1000 dTons. 2% of that works out to be 20 tons right? Now, if 20 tons handles the two hulls, but you take the interpretation that the 2% is a one time cost, then you're looking at a total of 20 tons keeps the ship operating as a whole and supports the single sub-hull at any given rate. If you assume that the 2% "extras" goes into the MAIN core hull, then 20 dTons supports the second sub-hull. Add a THIRD sub-hull, and now the 20 that was dedicated to handling 2 hulls, is split now between 3 hulls instead. Since I don't have access to the material, I don't know if they followed it as 2% per additional sub-hull added to the core hull or not. But if they don't handle it that way, then there is an inherent "logic" issue here that if I were to play MgT - I'd house rule immediately. Firmpoints are FIXED arc weapons (usually forward facing). Despite having more of them, they do less damage AND they are limited in arc of enemy engagement. All I can say at this point is that the rules are rather specific: you combine the elements together from its component parts. You don't get to add hard points because when combined, they equal a larger ship. The Core unit, designed as a 202 dTon hull remains a 202 dTon hull throughout the entire process from start to finish. Yes, that is meant as per connection. So, a four module breakaway system plus a core module, results in a loss of 8% of the ship's combined hull volume. Would it be safe to assume that this percentage loss is shared between the two hulls on a pro-rated basis? For instance, let's take a situation where we have a 400 dTon hull and a 600 dTon hull combined to rate as a 1,000 dTon hull. .02 x .4 = .008 and .02 x .6 = .012. The volume lost to the 400 dTon hull due to reinforcement would be 8 dTons, while the loss to the larger hull would be 12 dTons. Otherwise, the loss of volume is to the Core Unit only? Yup, the connections and such go on both sides. AndrewW wrote: ↑ No problem. Guess the rules could have been a little clearer on that. While we're at it, what about this situation? USMC is strapping armored vehicles to ships to defend against speedboats. The sensor and gun on a ground vehicle is better designed to locate and engage similar sized targets than the stuff on ships. I don't see any reason why it won't work for specialised armed small craft, turret-armed aircraft and whatever else. I had no problem handling the way hard points are supposed to be handled. Treat each breakaway ship as its own ship. Build each one as if it were the ONLY ship involved. Then, when you finished with that, you simply add together everything per the rules as if it were a single ship to determine the ship's overall aggregate stats when it is ONE single ship. Put another way? We're not building a 400 dTon Hull and splitting it into 5 sections - we're building five hulls, and combining it into ONE hull that is capable of breaking away into separate elements. You don't get to say that the ship starts with four hard points if its aggregate total is 400 dTons - and when it breaks apart, what happened to them. The ship is built up of its aggregate parts first, then joined together, and then flies as if it were but a single ship. My only suggestion is that one should not be able to have a turret AND a firmpoint in the same hull, as it essentially violates the premise that you can only have one turret per 100 dTons of ship. The rules are specific enough that 1 firmpoint equals 1 small turret (single weapon) and that two firmpoints combined are equivalent to a Barbette. When I read the rules about converting a firmpoint to a small turret, I wondered "Can you transition two firmpoints into two turrets? If a player asked me that were I the GM, I'd say "No" for just that reason. 1 Turret per 100 dTons. In any event - the example I gave earlier of having 8 firmpoints amongst four small craft elements is not abusive. Ranges are reduced for the weapons involved, or magazine numbers are reduced by a total of 2/3 for each of the missile launcher firm points. Take a single craft of 200 or 400 dTons - arm it with nothing BUT firmpoints in lieu of hard points. Take that new craft up against its original configuration and see which one wins the most battles. My bet is that it will be the original configuration. 1. When I originally interpreted the two percent wastage as per extra hull, I was contradicted in this forum. 2. It's also inflexible, as various types of attachments might need more or less clamping or connections, depending on actual size and configuration. 3. Firmpoint rules don't give leeway for dual and triple turrets, despite the fact that the weapon aystems are twenty five percent smaller, and all turrets remain a tonne; in any event, a sing;e firmpoint turret shouldn't require more that half a tonne. 4. Being transversible, hardpoint and firmpoint turrets enjoy the same degree of fire arcs, possibly more so on a smaller hull. 5. Just plop on the turret of a tank or self propelled artillery on an attack boat, it's now a monitor. 6. An artillery piece by itself would become a portee. Moppy wrote: ↑ While we're at it, what about this situation? 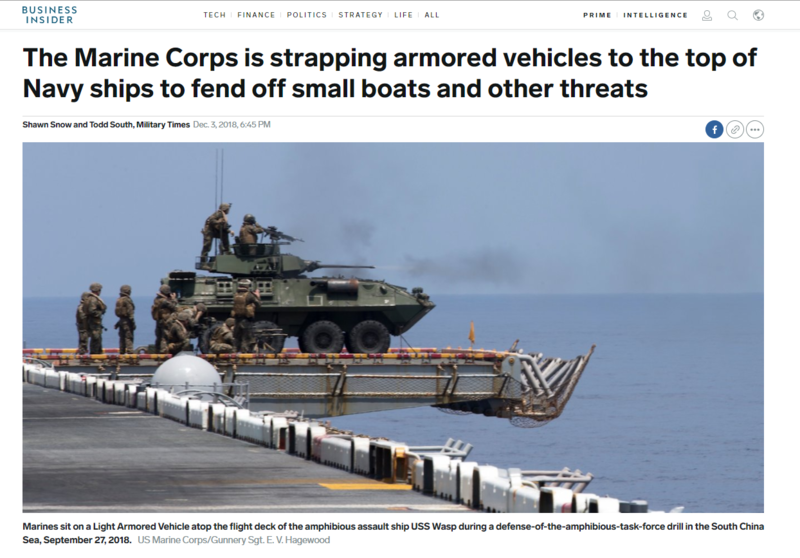 USMC is strapping armored vehicles to ships to defend against speedboats. I would say we are deeply into highly situational problems and Referee fiat. The 1 dt is the connection between the turret and ship, not the turret itself. Further, small craft apparently don't have the structure necessary to support larger turrets. HalC wrote: ↑ Treat each breakaway ship as its own ship. Build each one as if it were the ONLY ship involved. Then, when you finished with that, you simply add together everything per the rules as if it were a single ship to determine the ship's overall aggregate stats when it is ONE single ship. HG, p12 wrote: Breakaway Hulls: A ship can be designed so it can operate as two or more independent vessels, breaking or splitting away from one another. Each section must have an appropriate bridge and power plant to operate it. Manoeuvre drive, jump drive, sensors, weapons, screens and so forth are all options that can (and, under normal circumstances, should) be included in each section. Hull points of each section will be proportionate to the total Hull points of the ship. The total craft is "a ship". The sub-craft are "sections" with specific rules separate from the general design sequence. The total craft has Hull points, and the sub-craft are given a proportion of those; e.g. a 120 kDt ship divided into six 20 kDt sections has 80000 Hull and each section has 13333 Hull, despite a normal 20 kDt hull would have 8000 Hull. HalC wrote: ↑ When I read the rules about converting a firmpoint to a small turret, I wondered "Can you transition two firmpoints into two turrets? If a player asked me that were I the GM, I'd say "No" for just that reason. 1 Turret per 100 dTons. There is no such rule. Hard/firmpoints are limited by tonnage, turrets are limited by hard/firmpoints; a 70 Dt hull can have three single turrets, since it has three firmpoints. HalC wrote: ↑ Would you want to have the equation that 1 hardpoint can be traded in for 3 firmpoints? Would you then trade all of the hard points for 3 firmpoints? Sometimes, yes; e.g. instead of a missile barbette on a hardpoint I could have a missile barbette on two firmpoints and a single laser turret for PD on the third firmpoint. With a good crew three single laser turrets on firmpoints would be better at PD than a triple laser turret on a hardpoint. HalC wrote: ↑ Take a single craft of 200 or 400 dTons - arm it with nothing BUT firmpoints in lieu of hard points. Take that new craft up against its original configuration and see which one wins the most battles. My bet is that it will be the original configuration. Take the Fessor above: The core section has two hardpoints, so six firmpoints, and each of the four small sections has two firmpoints. The core section can mount three missile barbettes and each small section a single missile barbette for a total of seven missile barbettes. That is significantly better than the four missile barbettes a 400 Dt ship would normally have. You give up some magazine space, but no range.